This Oreo Chocolate Cheesecake Cake is a chocolately bundt cake with an Oreo cheesecake filling and it’s topped with a cream cheese glaze and more Oreos. When it comes to cake, I consider myself to be have some pretty high standards. This cake just couldn’t wait to be center stage. I made it on a whim but it’s one that I know is going to be a stand out this year (and that’s saying a lot considering it’s early January!). 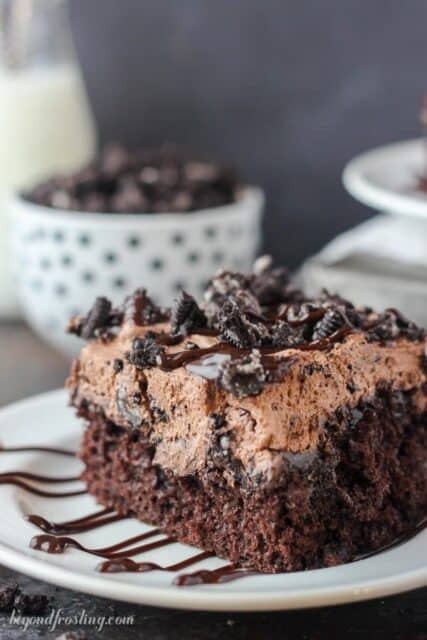 In fact, my boyfriend was quite sad that I made this when he was out of the house because it has two of his favorite things: chocolate cake and Oreos. I couldn’t stop talking about how good it was, so that didn’t help either. 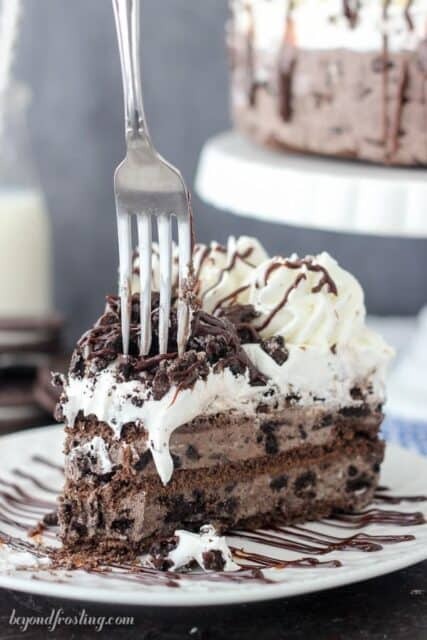 I kind of have a thing for Oreo cakes. 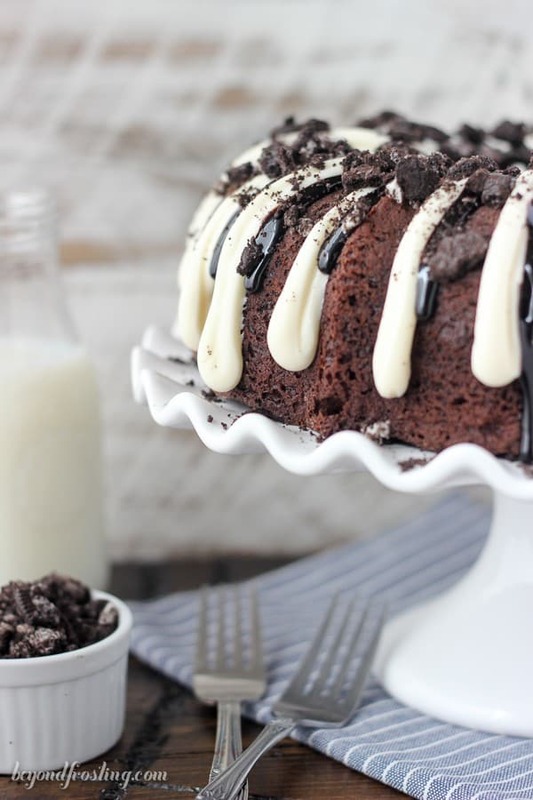 Eer-em-gee you guys, this cake is SO good! I am still sneaking bites of it tonight, but as quickly as I made this cake, I had to get rid of it, well most of it. I dropped it off at my friend’s house, she has 3 boys, and I know they took care of the leftovers. Sometimes I feel like cake mixes are not chocolately enough for me. Yes, I just said that. So for this cake, I added some extra cocoa powder. To combat the added dry ingredients, I used sour cream and vanilla extract. The sour cream of course, helps keep this cake moist. 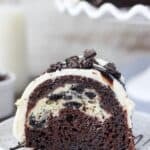 This recipe is my favorite dressed up cake mix recipe from The Cake Mix Doctor, I just choose to add the extra cocoa powder. When it comes to baking a bundt cake, there is one essential step you cannot skip, and that is to generously grease and flour the bundt pan from top to bottom. You do not want anything sticking to the sides of the pan. 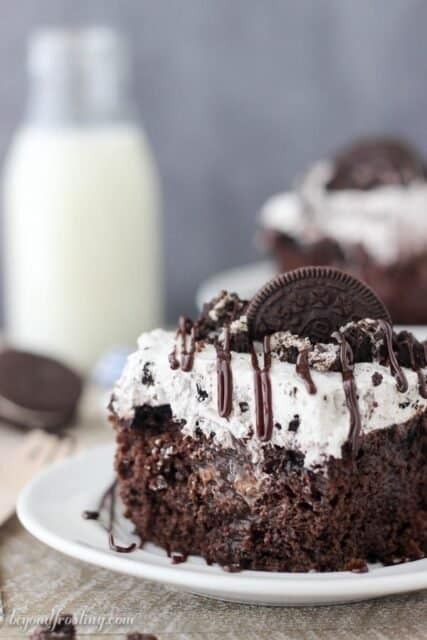 If you are baking a chocolate cake, it can be tough because you need the flour in the pan, but you don’t want to cake to bake with any white residue on the sides from the flour. On the contrary, using only cocoa powder to dust the pan can result in a much darker appearance on the outside of the cake. I finally found my solution! I used a mixture of 50% flour and 50% cocoa powder. Cha-ching! 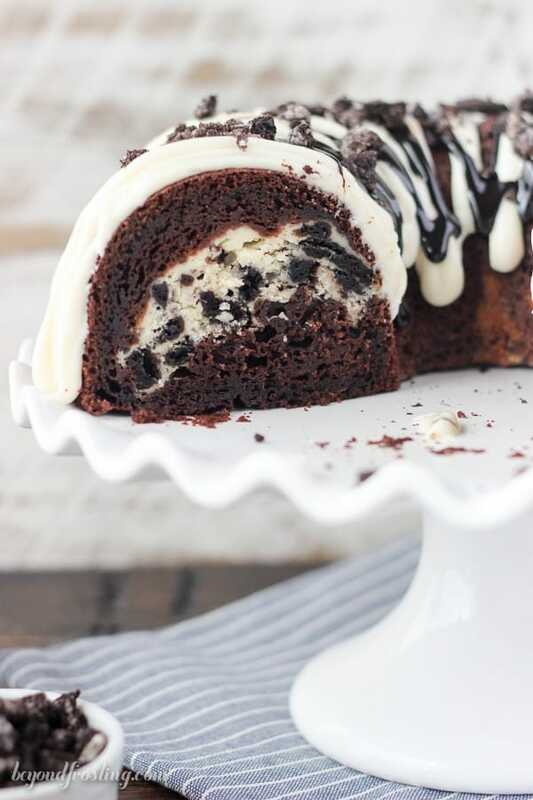 Now let’s talk about that luscious Oreo cheesecake filling. It’s the basic cheesecake filling that I used in my Strawberry Cheesecake Cupcakes and my Mint Cheesecake ones as well. It’s your typical baked cheesecake ingredients: cream cheese, eggs and sugar. For this cake, I folded in some crushed Oreos. This filling is layered into the cake, and it’s super easy. You just put some cake batter in the bottom of the pan, then the cheesecake filling and then pour the remaining cake batter on top. You just want to be sure to fill in all the nooks and crannies in the bottom of the pan. Finally, the icing on the cake- literally. 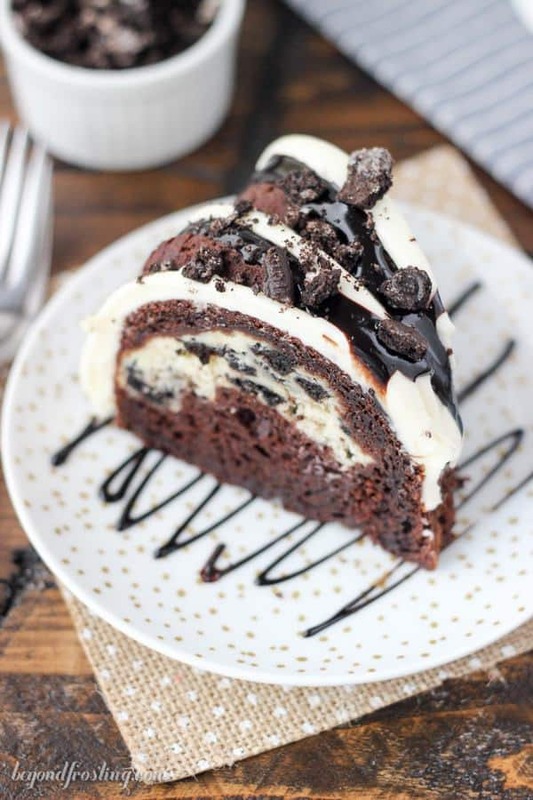 It’s an easy cream cheese glaze, hot fudge and more crushed Oreos. The glaze is simple, but you’ll likely end up with leftovers. It’s very difficult to use less than 4 ounces (half a block) of cream cheese, and you need enough powdered sugar to thicken the glaze. Therefore, you’ll have leftovers, or you can very generously cover this cake with glaze, I’m okay with that! I seriously couldn’t wait to cut into this cake!!! I promise that this cake will be gone before you know it. For the cake: Preheat the oven to 350° F. Generously grease a large bundt pan with Crisco and coat it with a mixture of 50% flour and 50% cocoa powder. Do not skip this step, it is important to help the cake release from the pan! In a large mixing bowl, combine the cake mix, cocoa powder eggs, oil, water, sour cream and vanilla extract. Mix all of the ingredients until they are well combined. Set aside. For the cheesecake: Remove the wrapper and microwave the cream cheese for 20-25 seconds. In a medium-sized bowl, combine the softened cream cheese with the egg, granulated sugar and vanilla extract. Mix all of the ingredients until they are well combined and smooth. Stir in the crushed Oreos. Place at least 1/3 of the cake batter into the bottom of the greased and floured pan, be sure to cover at least the bottom nooks and crannies. Then spread the Oreo cheesecake over top of the cake batter and try to spread it evenly. Finally, cover the cheesecake layer with the remaining cake batter. Bake at 350° F for 45-52 minutes. Note that baking times will vary by oven and pan type. To test the cake for doneness, insert a knife into the cake, if the knife comes out clean, the cake is done. Allow the cake to cool for at least 15-20 minutes and gently run a knife around the sides of the pan to help release the cake from the sides of the pan. Turn the cake onto a pan by placing the pan on the top of the cake and use two hands to invert it. Allow the cake to cool completely. For the topping: Remove the wrapper and microwave the cream cheese for 20-25 seconds and then beat the cream cheese until it’s smooth. Then add the powdered sugar and vanilla extract and beat until the ingredients are well combined. Then slowly add the heavy cream, one teaspoon at a time until the cream cheese reaches your desired consistency. It should still be thick, not watery, but it should run off your spoon without too much effort. Place the cream cheese in a piping bag and cut off the edge of the piping bag about ¼-inch from the bottom. Pipe the cream cheese frosting along the top and sides of the cake. Next, heat the hot fudge according to the instruction on the jar and repeat the same steps to pipe the fudge sauce next to or over the cream cheese. Finally, sprinkle more crushed Oreos over top. Keep this cake refrigerated in an air tight container. Just took a chance on this beautiful and delicious burnt cake and it was received with raves. I sprayed the pan with Baker’s J oh ( as I do wil pall my cakes and the release was smooth and clean. 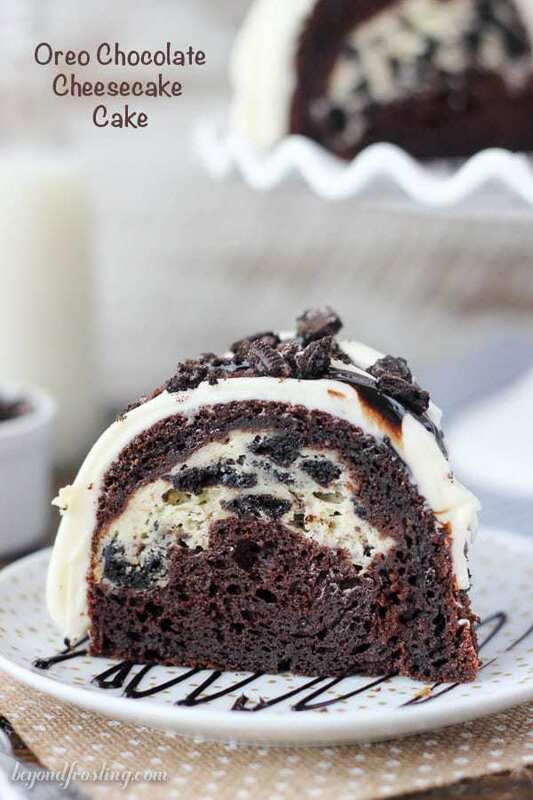 Cake seemed a bit heavy, dense whan plated but when the cream cheese glaze and fudge was added, Chunks of Oreos scattered on top, it was dense but not dry and the cream cheese filling (which I mixed with mini chocolate chips) simply Devine. 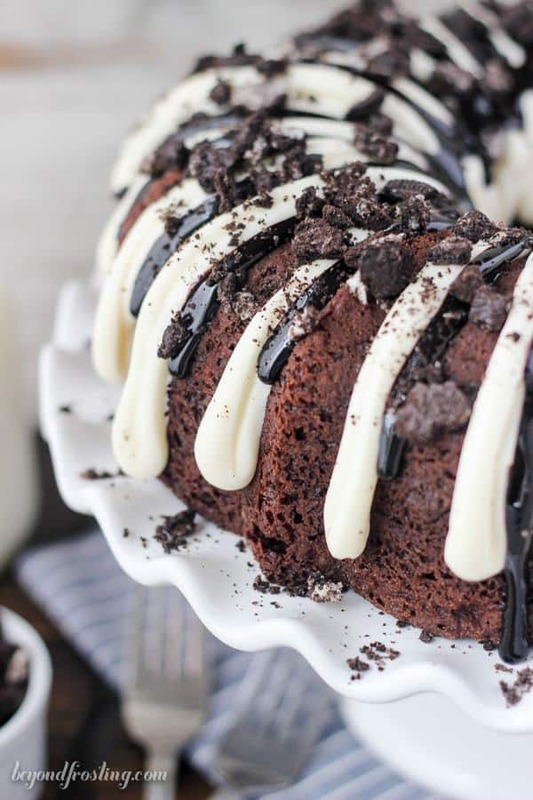 That is one that goes into the retation.Wonderful, wonderful Bundt cake and although I never use cake mixes, the addition of the extra cocoa, and butter subbed out for the oil produced a perfect, delicious and beautiful cake. With a delicious, moist crumb. Thanks for this recipe and looking forward to receiving more from your blog. Merryl! Thank you so much for sharing!!! that is awesome! I have never tried subbing out butter for oil with cake mixes, I will have to try it some time! Thanks for the feedback, I am so glad you enjoyed it!